Description: Caribbean Resort Master Planning services for a Luxury Resort situated on Eleuthera Island, east of the Bahamian archipelago. 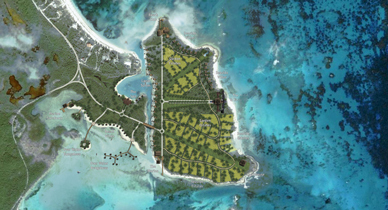 The design and planning efforts were presented to the Bahamian Government showing the feasibility of a resort on the Caye. The concept is set up on a series of directional axes utilizing the islands natural topography and maximizing ocean views. The project included siting 40 one-acre, Garden Estates, an 80 key hotel and spa, a marine sanctuary, overwater bungalows, and an iconic arrival lighthouse on the tip at the southern sound.